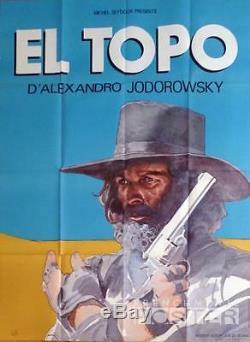 ORIGINAL LARGE FRENCH MOVIE POSTER OF " EL TOPO ". SIZE : 47X63 INCHES (120X160 CENTIMETERS) ART BY : MOEBIUS (AKA JEAN GIRAUD). POSTER IS FOLDED IN EXCELLENT CONDITION. POSTER HAS VERY SMALL TEARS ON THE BORDER. OUR WATERMARK IS NOT ON THE ACTUAL ITEM. OVER 20 YEAR IN THE MOVIE POSTERS BUSINESS. WE OFFER THE LARGEST CHOICE OF OLD AND NEW FRENCH MOVIE POSTERS. FRENCH MOVIE POSTER SHOP IS APPROVED BY LAMP. POSTERS ARE SENT PROTECTED BY CARDBOARDS IN A STRONG PARCEL. Get Images that Make Supersized Seem Small. Attention Sellers - Get Templates Image Hosting, Scheduling at Auctiva. The item "EL TOPO JODOROWSKY / MOEBIUS ORIGINAL LARGE FRENCH MOVIE POSTER" is in sale since Wednesday, July 27, 2016. This item is in the category "Entertainment Memorabilia\Movie Memorabilia\Posters\Originals-International\1970-79". The seller is "fmp2000" and is located in PARIS. This item can be shipped worldwide.